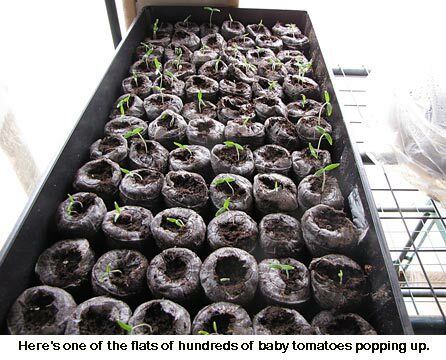 Meanwhile, I’ve been canning up a storm. I just did 14 quarts of chili, 7 pints of leftover kidney beans, 3 quarts and 3 pints of boneless pork loin, and a little plain crumbled hamburger. Now I’ve got to get out more meat to thaw. Time to get another big batch done ahead of Easter dinner cooking and baking. I’m SO glad to be feeling better! Will is lots better too. 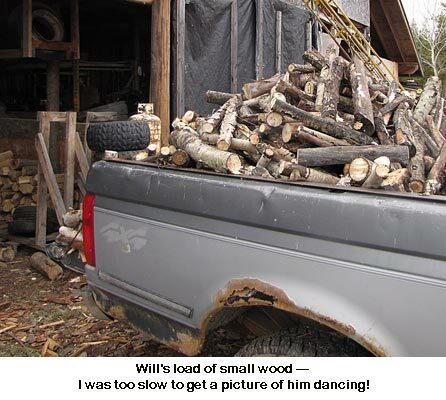 He cut up a big load of small wood, loading it into the pickup. I just looked out and he was unloading it with his radio earphones on and he was dancing to old-time rock’n roll! You are very welcome! We love our whole family, including you special BHM family!! Yes, live IS good! We are greatful for that every single day. And especially when you’ve been down and spring is here!!! You all have a happy, blessed Easter, every single one of you!!! Just read some of your 2007 archived posts about being satisfied with what you can do, and taking time off to enjoy the little things. I got a chuckle out of one post where you comment about your “@#&*! !” cell phone ringing in the middle of nowhere… out in the woods. Good stuff. Who knew I would get this therapy here to start off the day right. Thank you for all that you do. SO glad you are both feeling better! Can just picture Will out there dancing. Life is good! So glad you are both feeling better. After not feeling good, we realize how much our health is worth. Have a happy Easter and I hope the kids and grandchildren can be with you. Dancing to old time rock and roll makes everything either easier, faster, or better. Go Will, and go Jackie.